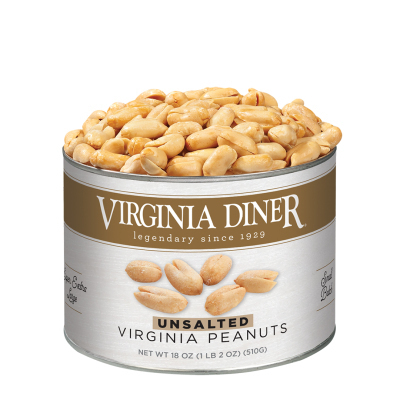 Our Super Extra Large Virginia Peanuts blistered for that unique Diner crunch without the added salt for those who enjoy a heart-healthy snack. 18 oz. vacuum-packed tin. Received American Heart Association's® Heart-Check Mark. Peanuts and Expeller Pressed Soybean Oil. Manufactured on Equipment that also Processes Peanuts, Tree Nuts, Soybean, Wheat and Milk Products. Contains: Peanuts. I love the flavor of the unsalted peanuts. Wonderful crunch to the too. Glad unsalted are an option! Loved these as much as I can (I still prefer a little salt, but can't have it). Can was dented on arrival, nuts survived. 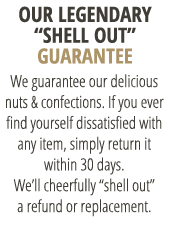 Do wish there were more whole nuts/can. I've eaten peanuts all my life, and was given some of these as a gift. When they were gone, I had to have more! I have relatives in Va. so I knew which ones to get. I was not a big peanut eater before trying your unsalted peanuts. They are the best! When we visit friends out of town, I usually purchase peanuts to take. Usually take the salted ones. Best peanuts in the world! These peanuts always make a huge hit at Christmas or any other time. Best peanuts we've ever tasted! Keep up the good work VA Diner! Owner Response: Mr. Elliott, We are so sorry for your loss. I have changed all of the contact information on your account so that this will not happen in the future. Thank you for being a Virginia Diner customer! Excellent peanuts. Received some as a gift at Xmas. Had to have more. Good stuff. These peanuts are delicious. They are big, crunchy and addicting. I can't stop eating them. Will buy more!! !